The premise here is that the Minions are actually immortal beings who, since the creation of the earth, have sought to pledge their allegiances to most evil creatures they can find. (And yet they’re not New England Patriots fans. Odd.) So an amusing prologue has them throwing their lot behind a T. Rex, Dracula, even Napoleon, usually inadvertently leading to the demise of the object of their affection. Since the Minions can only speak in a sort of polyglot hodgepodge (I heard “papaya,” “c’est la” and “mazel tov” sprinkled among their vocabulary), Geoffrey Rush provides extensive voiceover explaining the Minions’ backstory. The film actually doesn’t need it, and would have been better off just letting the Minions babble incomprehensibly and let the visuals tell the tale. 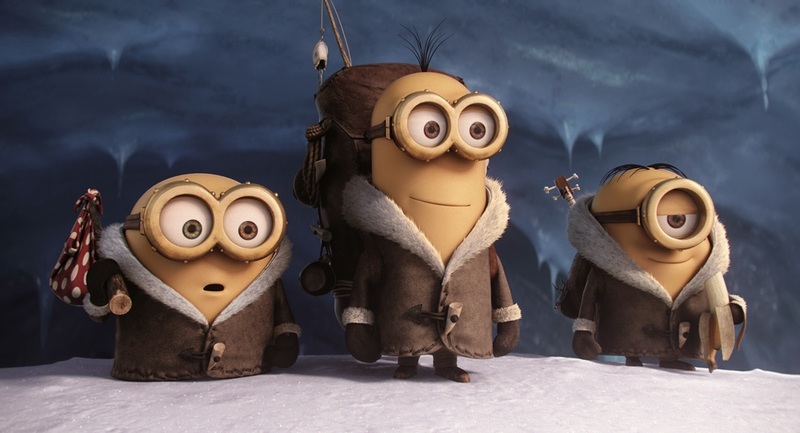 With the hordes of Minions having run out of villains to follow and getting kind of depressed, it’s up to three Minions — stalwart Kevin, dippy Stuart and innocent little Bob — to leave the tribe and go find the next big villain to follow. This quest takes them, as it turns out, to 1968 America, and the film surprisingly conveys rich textures and depths in evoking this bygone era — when the trio camp out in a giant Marshall Fields’ like department store, you can almost touch the wood grain on the escalators. After hitchhiking to Florida with a bank-robbing nuclear family (Michael Keaton and Allison Janney play the parents, and the film could have used more of their brand of cheerful sociopathy), the Minions attend Villain-Con and discover supervillainess Scarlet Overkill (Sandra Bullock). To win a job with her, Scarlet and her mod boyfriend Herb (Jon Hamm) task the Minions with going to London and stealing the crown off Queen Elizabeth’s head. That’s probably too much plotting for a film that really gets its juice from the absurdity of its main characters and the way they babble and bumble their way through existence. Co-directors Pierre Coffin and Kyle Balda include some great bits of throwaway comic business for the Minions, such as Bob’s friendship with a rat or Stuart’s secret yearning to be a rock god. It’s the storyline and the star-voiced human characters that drag the film down. It’s no accident that the best Minions scenes in a “Despicable Me” film are those little fourth-wall-breaking skits during the closing credits, when it’s like the creatures’ pratfalls and nonsense talk are speaking directly to the pure id of their young fan base. Maybe if parents acted like supervillains more, kids would rinse their dishes obediently. 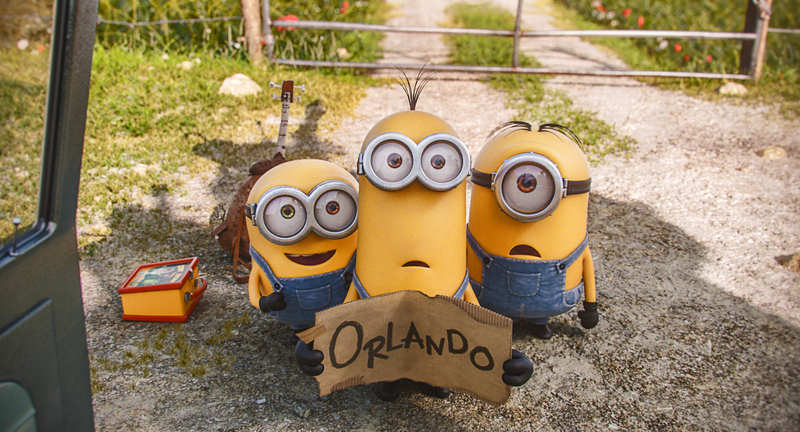 Lightly Miniony fun throughout, this Minionish comedy should please fans of general Minionishness who don’t mind the goofiest Mininionesque gags.